Last week Chinese eCommerce giant Alibaba announced its Q3 earnings. Cloud revenue was $553 million, an impressive 104 percent year-over-year increase. That comes out to a run rate in the range of $2.2 billion, well behind Google which announced it is pulling in a billion dollars a quarter and still buried behind the market leaders all of whom reported around $4 billion+ a quarter. While the growth was impressive, keep in mind when you have a small market share, it’s much easier to grow a big number than when you have a larger market share. In other words, it gets harder to grow, the larger you get. Synergy reports that the cloud market grew 46 percent in the fourth quarter, and each of the biggest cloud companies benefited over the smaller ones. 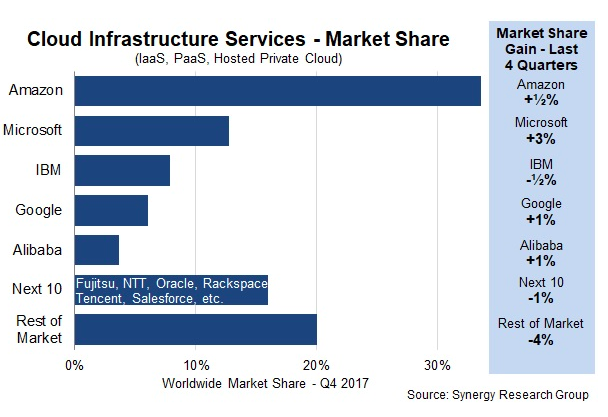 “In large part the expansion was driven by aggressive growth of Amazon (AWS), Microsoft, Google and Alibaba, who all increased their share of the worldwide market at the expense of smaller cloud providers,” Synergy wrote in their report. The fact that smaller players continue to struggle in the cloud market isn’t that surprising, but it makes Alibaba’s rapid rise all the more remarkable. That Alibaba has shown up at all is a testimony to how fast it has grown. Even though Alibaba launched its cloud business in 2009, just a few years after AWS, the company really only began taking it seriously as a business in 2015 with a billion dollar investment. That didn’t seem like enough at the time, but it has taken some big leaps to get to this point so quickly. While the majority of its business is in China and Asia more broadly, that is a huge market and gives Alibaba enough lift to grow fast and move up in the market more quickly. 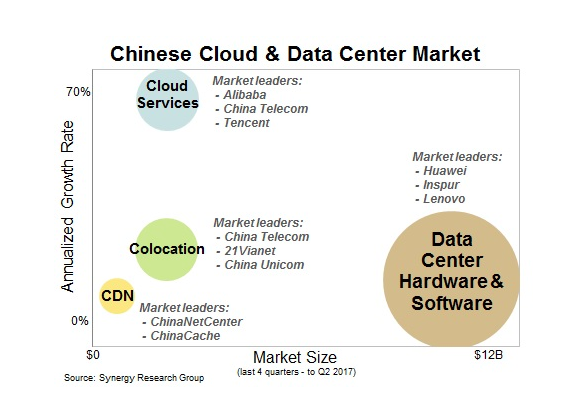 In another report from Synergy published last year, it found to no one’s surprise that the Chinese cloud market was dominated by Chinese cloud companies. Alibaba was at the top of the cloud services market tier, which wasn’t the most lucrative, but was the fastest growing. For Alibaba to really expand its share and move up the graph, it probably needs to build a bigger market in the west, particularly in the US. It currently runs 14 data centers worldwide with just two in the US, one in Silicon Valley and one in Virginia. It is expanding rapidly with plans to build several new data centers in China, Malaysia, India and Indonesia. For Alibaba, the explosive growth numbers are positive news, but it still remains far behind market leader AWS and other big players like Microsoft, IBM and Google. Whether it can sustain that level of growth over the long term remains an open question, but for the short term it surely has been impressive.